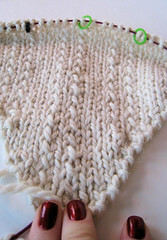 Knitters are the best people! I got a surprise in the mail yesterday! Zonda knew how long I’ve been waiting to sell my house and move into an apartment so she sent me this fabulous tote bag as a house warming gift! Even more awesome! 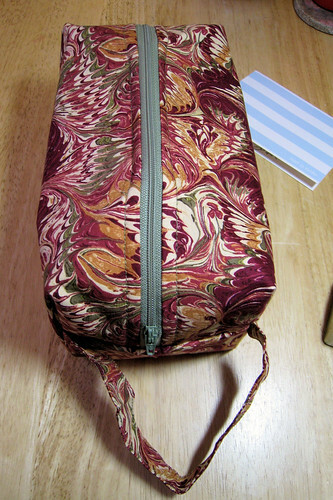 She matched it with the double point needle case and Interchange case I’d already bought from her shop. She even remembered what fabric my other cases are so it matches! Like all of her other stuff it’s so well constructed! Just beautiful. Thank you so much this was so thoughtful! 1. I like raisins, just not in my oatmeal cookies. 2. I think we all know about my love of green! 🙂 I’m trying to branch out but it’s hard. 3. I’ve mentioned my pen issues before, but here’s another, I can not live with out my drylighter. I use it all the time! As far as I’m concerned who ever came up with the idea is a genius. 4. speaking of genius, I get the saying “the best thing since sliced bread” but really I think think of other things that are better, like air conditioning in the summer. Given the choice between air conditioning or sliced bread, I’ll gladly tear chunks from a loaf any day. 5. I don’t have any expensive jewelry, not one piece, and I’m completely ok with that. 6. I’ve never wanted to get rid of my freckles, I had no idea other people did until I was older. You scored 50% intoxication, 75% hotness, 75% complexity, and 75% craziness! You’re pretty much insane. You’re probably from another planet, even. When you’re around people, you go straight for the crown chakra and get them all tingly. You’re often imitated by those who want to be like you, but you’re definitely one of a kind. First off, my Secret Pal freaking rocks. Seriously you guys. I got home today and there was a box from the florist sitting on my door step and I could not figure out who might have sent it. Oh I can think of a coupe people who owe me flowers but none that would actually send them. 🙂 When I hoped it – they were from my Pal! 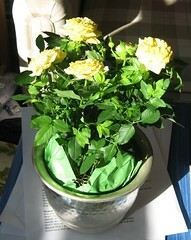 A miniature yellow rose bush in this cute silver container. It went on the end table right next to my knitting space. Sharon of Holy Knitballs tagged me with the 8 Things About Me Meme last week and I haven’t been able to think of 8 things. But now Monica of Ruby’s n Purls has tagged me too so I have to it! I always want to know how things work. I’ve never stopped asking “why”. I’m pretty sure it drives people nuts, including my boss. Oh and I’m not usually this lazy, but if you’re reading this consider yourself tagged!